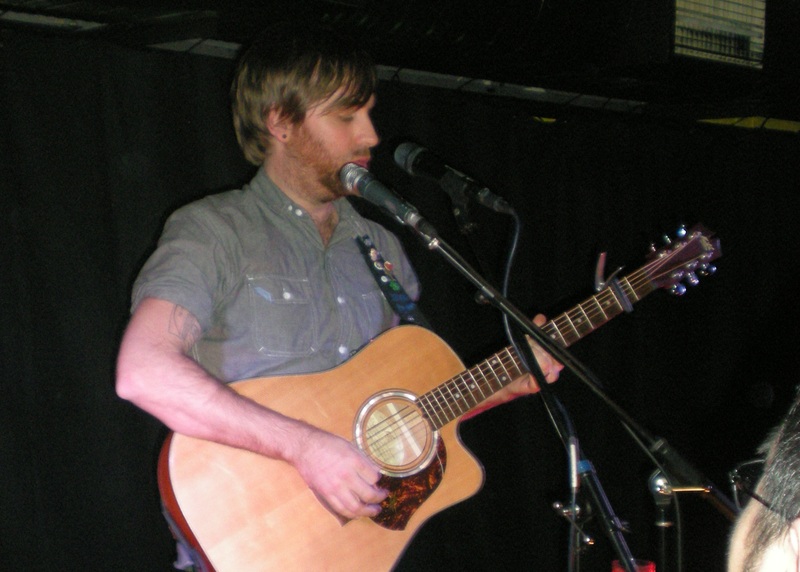 I’d never been to the GoodGod Small Club until Josh Pyke decided to host his Fans First Tour Sydney show there. I’d heard of it, I’d heard stories of when Mumford and Sons played at a Communion night there (backing Pete Roe). Just by the name, you would assume it’s a small room, but I hadn’t really conceived just how small, but I’m getting ahead of myself. We rocked up early to grab a bite at The Dip, the cantina style restuarant inhabiting the front bar area of GoodGod. Not a huge menu to choose from, and the meals themselves weren’t enormous, but they were interesting flavour combinations and really damn tasty. With the food being so nice, we decided we had to share a dessert, the cookies and cream, which turned out to be one of the tastiest dessert’s I’ve had in this city. Salted caramel ice cream, that’s all I’m saying. While we were waiting for our dessert to arrive, we noticed a long line of people along the wall all the way out of the club. At this point we realised these were the fans all vying for the best spot in the club, and we were not in that line. When we finally joined the end of the queue and made our way in to the GoodGod dancetaria room (the ‘Small Club’) we were struck at just how tiny and intimate the venue actually was. There wouldn’t be more than 20m from the stage to the bar, and this night was sold out so the room was quite full of eager fans. The support act, Jackson McLaren, was a friend of Pyke‘s and took to the stage in a black western shirt, looking a little like a young Richie Valens, to woo the crowd. His style was quite relaxed and we often felt we could have been listening to an early Paul Kelly with a mixture of Bob Dylan, Tom Waits and even Simon and Garfunkel thrown in there too, just to mix things up. I get the feeling McLaren is still finding his own style and voice, it’s in there, some of it emerges through his current repertoire, and I’m sure it will only further develop as time progresses. Finally the man of the hour took to the stage. Looking very chilled out and a little bit excited (or maybe that’s anxiety), Josh took to the stage with a huge grin as if greeting a bunch of old friends. It’s been a long time between drinks since the Basement Birds took him away from his solo work, but everyone had a bevvy and were ready for lots of favourites as well as a raft of new tunes. Performing solo, Pyke created the layers in each song by looping sounds from his iPhone, a tambourine, vocals and percussion played on the body of his guitar. It was evident he was having great fun on stage, f*ck-ups and all. The night was packed with many, many old favourites, some I didn’t realise I knew the words to until I was singing along with every other person in the room. He played a great cross section from his back catalogue and the smiles on every face were evident of a great show. Pyke was very friendly and familiar on stage, almost as if mucking around in his lounge room when some friends had popped in. He recognised fans from shows and told stories of how he knew them (one of which had been injured at two shows, hopefully a trend not to be continued). There was the “I Love You” girl who shouted out between songs and Pyke happily replied “I love you too”. We were surprised his set wasn’t peppered with more new material. Of course he played his current single “No One Wants A Lover” which we were all singing along too. Two other new tracks made it in to the set, one of which I can’t remember the name but made me think of sunshine and clouds on a summer’s day. The other, “Factory Fires”, was a really lyrically interesting story with an almost lamentful musical air. While he did occasionally struggle with the technology to create the looping tracks, it eventually turned in to a fun game where silly comments and crazy beats would come together and at one stage Pyke broke out in to a rap… but it didn’t last long. The night was filled with many sing-along moments. To end the night, and because there isn’t really a “back stage area” at GoodGod, Pyke pretended to head off stage and we all roared for an encore, even though he’d merely stuck his head under the back curtain. He pulled out a new song for us, and promptly forgot the words. The crowd suggested he Google them on his iPhone, but the new album is so tightly under wraps that there was nowhere online he could have found them. Instead he took a request from the crowd and commented he’d need help with the words as he hadn’t played it for around five years. The night wound up with huge cheers and clapping from the room full of fans. We’d all been part of something special, an exclusive peek in to Josh’s world without all the hype and pretense of a large gig. This was Josh as our friend, and that’s why he put the fans first for this mini tour. With two more show left tonight and tomorrow, fans in Adelaide and Melbourne are set for a real treat. For those who missed out on tickets to the Fans First Tour, the Sparrow’s Only pre-sale tickets are now available for Josh Pyke fan club members. If you haven’t signed up for the mailing list yet, you might want to do it now and get in for tickets before they go on sale to the public on 7th July. Wilco, the kings of American alt-country, have just announced a brand new album to hit shelves on the 27th September this year. Titled The Whole Love, the album announcement comes off the back of a bunch of new Wilco material hitting the interwebs including the new single “I Might” (see below). We’ve had some absolutely amazing festival lineups in Australia over the years but its very easy to cast your eyes overseas, especially to the UK and US, and feel a little bit jealous of just how good they’ve got it. Case in point was this year’s Glastonbury Festival which not only finally had great weather (no mud baths this time!) but also sported a lineup you’d give a kidney to see here in Australia. The BBC managed to capture many of the performances from the weekend to be streamed from their official Glastonbury web site but sadly those streams are only available if you live in the UK (or if, y’know, you have a UK proxy server), something that’s frustrating for fans here in Australia. But as luck would have it the BBC have very kindly let a few key performances (like the Mumford and Sons one from a couple of days ago) slip quietly onto YouTube for all the word to see. THIS IS IT!! Finally… part two of the Bumper Bluesfest Review. Of course, it was totally planned this way. Just in time (ahem) for the news that Bluesfest are extending the deadline for Pre-Earlybird tickets for the 2012 festival! As they say, there’s no better time than now! Anyway, more about the 2012 festival at the end. A quick re-cap… so far, since Part I, we are half way through the marathon 6 day festival, having had the pleasure of watching Ben Harper, CW Stoneking, Eric Bibb, Ernest Ranglin, Fistful of Mercy, Funky Meters, Imogen Heap, Leah Flanagan… (DEEP BREATH)… Mavis Staples, Michael Franti, Mick McHugh, Ray Beadle, Rodrigo y Gabriela, Ruthie Foster, aaaaand Trombone Shorty! From soft and sweet, to evocative and tribal, Canadian-Indian songwriter and performer Buffy Sainte-Marie was about to take the fans and new comers on a journey through her Cree heritage, her career as a songwriter, and her passion for social justice. Not knowing far beyond the classics Up Where We Belong, and Universal Soldier, my expectations were wide open, and what I experienced was an education! Musically, culturally, politically. There are two sounds that Buffy excels at… the softly spoken folk singer, and the passionate warrior singing from the voices of her ancestors. Her unconventional vocal style for those ‘heavier’ songs may shock, but you soon realise that this is the sound of a people, as well as one woman, and her experiences. The warrior came out in full force for her epic closing song, Star Walker, that features the folk singer meeting head on with a barrage of Cree chanting, and rock guitars. I’d have to agree with other responses to her set that there was a certain something that came over the crowd. An immense respect for a legend, and understanding of the social and cultural messages she was offering. The time was drawing near. With one set to go, the artist who had inspired, transformed, and near turn upside down Bluesfest 2011 was not far away. Droves of fans had been gathered, saving their places, sitting tight in anticipation for Bob Dylan to hit the stage. Blessed with an almost capacity Mojo stage crowd, Warren Haynes took the stage, playing as what could be described as the ‘warm up’ for Bob Dylan. But any notion of Haynes as a support act soon drifted, as he launched into his set of guitar driven, rock heavy blues without hesitation. It became apparent that a significant number of people in this crowd weren’t just here for Dylan, and did indeed know of Haynes and his projects (Gov’t Mule, The Allman Brothers, and The Dead (featuring members of The Grateful Dead), and were keen to catch his return to Bluesfest for 2011. Regardless of notoriety, everyone had the opportunity to see Haynes in full swing, in no way slowing down or sitting comfortably in his fortunately positioned set, proving to this evening’s mixed crowd why he is one of the quintessential Bluesfest artists, who in turn showed due respect. Now the time had come. With much patience, aching leg, and sore behind, the hunger of hundreds of expectant fans was about to be quenched. Bob Dylan was in the house. Now, most readers of Timber & Steel should be familiar with the reaction of fans and first time viewers of Dylan’s current live show. The figurehead of classic politically charged folk music does indeed keep to himself off stage, and through the entirety of his performances. It’s not that it appears he’s not enjoying himself. In fact, I caught him tapping, and rocking in time to the music, and releasing the occasional grin from behind the keyboard at various stages. And despite Dylan’s questionable degree of physical contribution to the content of the performance, there was no denying that there was a performance taking place. And whether or not that performance had much of a resemblance to the Dylan records that many of those present had been listening to for years, nay, decades, there were songs being played that had a rhythm and melody, and were unmistakably, by definition, songs. So, what’s all of the fuss about? I try to be optimistic about anything I see live, and being the second time I had seen ‘21st century Bob’, there were no surprises. This was Bob as he is today. Regarding a television interview I recently watched of him interviewed for American 60 Minutes, recalling Dylan’s set, it seemed evident that Bob certainly has surrendered to the thought that his golden era of song writing from the 60s was ‘magic’, and that he had lost said magic, just cruising along on his fictional Never Ending Tour. While this era of Bob Dylan may be the vehicle on which he departs this world, it may turn out to be one of the highlights of his career. Where in the 80s there was a lull, this modern Bob could possibly, in his twilight years, be forging a new path for songwriters to come. 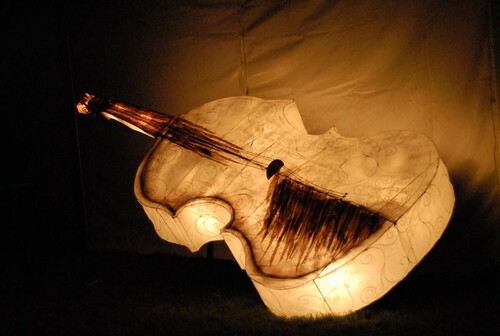 Though lacking the ‘magic’, this craft may go on to evolve into a fresh guise of the ‘new folk’ scene. Bob has reinvented himself. Some would say he’s devolved, but what we are witnessing may prove to be the sound and model that lays the way for folk to come. It cannot be denied that Dylan is a hard working man, and in this age rock stars and idols, the role of ‘legend’ is being down played, and in fact, one of the most influential, prominent artists still alive, recording, and performing today has not changed that much at all. Still bucking the trend, retreating from what is expected, and not giving his followers too much of what they demand. After seeing Dylan, Jethro Tull’s set was a vast contrast. A sea of Tull fans of all ages were out in force and eager to catch one of the more animated acts on this year’s festival lineup. Choosing to stand at the rear of the tent, I took in the entire magnificent spectacle unfolding before me. To my left, middle aged devotees who had most likely seen ‘the Tull’ countless times since the sixties and seventies. To my right, a gang of twenty-something ‘kids’ who had possibly been exposed over the years via their parent’s record collections. 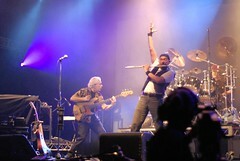 As for the band, they were strikingly tight, and Ian Anderson’s on-stage reputation was in full swing! With trademark theatrical presence, and over the top facial expressions, he leaped across the stage, flute in hand, as if barely a year had gone by. It appears the band and fans alike have tapped into some kind of musical fountain of youth. The set included several of their epic hits such as Thick as a Brick and Aqualung, and venturing into classical territory with their rendition of Bach’s Bouree. Fans got what they came for, and when left chanting for more, the Tull delivered, returning for an encore that left droves of middle aged Tull fans satisfied, shaking their heads in awe. As for me, it was an opportunity to see one of the greats, and I now understand what, indeed, makes a Tull fan. 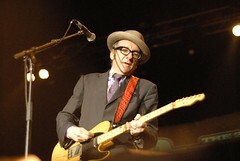 Whilst some ‘blues’ and ‘roots’ puritans are still questioning the validity of some artists being on the bill, the rest of us are getting on with loving the huge array of music on offer at Bluesfest, and Elvis Costello is one of those artists that few other festivals in the country would even attempt to book. On his last visit to Australia in 2006, the man graced the halls of the Sydney Opera House with the Sydney Symphony Orchestra. 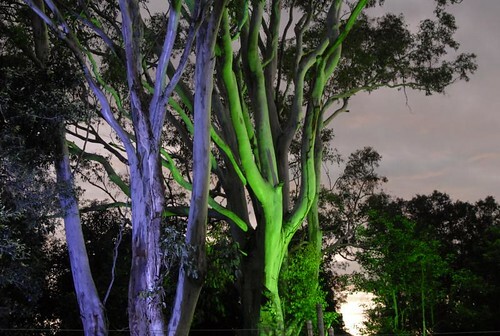 Five years later, the harbour and porcelain sails have been replaced by trees, canvas, and the wild weather of the Northern Rivers, with a much different show in tow. This is Costello in festival mode, with his full live band The Imposters, and a swag of hits and special surprises ready ready for fans, and the new alike. Including Pump It Up, Watching The Detectives, Either Side Of The Same Town, Shipbuilding, Good Year For The Roses, and (What’s So Funny ‘Bout) Peace Love & Understanding, just to name a few, there was never going to be enough time to do the man’s eclectic catalogue justice. The ‘secret’ ingredient was a song with special guests the Secret Sisters, who are no strangers to an Elvis Costello stage, having been guests on several other shows and tours throughout the States. He even suggested that he’d like to bring one of them out here at some stage. Here’s hoping! Exiting the festival on the penultimate evening, I managed to catch the closing songs of Mad Bastards. Taking their name from the film for which tonight’s music was written, the collaboration of Alex Lloyd and the Pigram Brothers surprisingly makes quite the fitting trio. Lloyd‘s often melancholy tones, coupled with the indigenous folk of the Pigram Brothers suits the damp, cooling midnight air, filled with smoke from a nearby food stall. The music seems quite reflective of the Kimberly area where Lloyd, Alan and Stephen Pigram wrote these songs, and the remote rural indigenous community where the film is set. Though Alex Lloyd’s commercial success has been varied in recent times, he is an artist who has continued to produce music, despite what the media or critics say. A soundtrack collaboration is a welcome change for the otherwise ‘pop’ artist, and on this night, taking more of a bIues approach, I witnessed the end of a beautiful set from three artists creating a unique new sound in the Australian musical landscape. Entering a well soaked Tea Tree Farm for the last time this festival, I was just starting to get used to gumboots, gravel, and a staple diet of Mayan coffee and Byron Bay Donuts. Via a few repeat performances, I made my way to see another regular to Bluesfest, Paul Kelly, who so naturally fit in to the final day’s proceedings. Whilst the bill was full of long lost legends, international guests, and festival new comers, there was no need for fanfare or hype. Whether nestled within the big top, or gathered beyond the cover of the canvas to the Mojo’s outdoor screen, the crowd was ready to spend some quality time with one of Australia’s greatest singer/songwriters, in what was feeling like the biggest back yard gig ever! 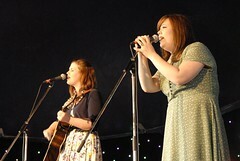 Kelly was joined on stage by the equally legendary Vika and Linda Bull, who not only provided backing vocals, but also presented their own takes on a selection of Kelly’s songs. Driving through his hits, including Dumb Things, Before Too Long, and Deeper Water, this was a more focused Kelly that I’d previously seen, working hard (and succeeding!) to fit as much as possible into the time given. Towards the end of the set I went for an urgent pit stop, and on the way, down one of those ‘authorised personnel only’ roads, I witnessed one of those perfect little festival moments. Several festival workers, volunteers, officials, and security folks on a break, huddled together, utilising a few up turned road cases, and various parts of a ute, to gain a vantage point over the barrier fence, fixated on Kelly and co. as he closed with How To Make Gravy. One of those special, simple moments that was so fitting for an artist like Paul Kelly. I’m glad I went for that walk. 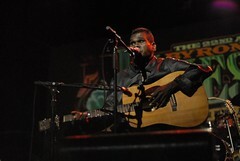 I last saw Geoffrey Gurrumul Yunupyngu, now performing under the name Gurrumul, at the Peats Ridge festival in 2008. Two years later, and a new album released, Gurrumul‘s profile has grown, as has his repertoire. But there has been no change to his soft, yet powerful sound. Though, this Bluesfest we are seeing two sides of Gurrumul, both solo, and as a member of the Saltwater Band, a vast contrast to his usual ethereal indigenous vocal performance. Watching the Saltwater Band helped me appreciate the sound of Gurrumul more, having seen a more expressive and musically playful side to this notoriously shy, softly spoken (if speaking at all) artist. When he shifts into solo mode, the beats and dancing are traded for respectful, and awe filled silence, but tonight we still see some of the playful side of Gurrumul, giggling at one point over some private, on stage comment. His audience, whilst sympathetic to his blindness, seem entranced by his musical talent, and respond with cheers and much deserved applause. Whilst we often crave some form of acknowledgement of, or engagement with the audience from the artist, here there is simply a man sharing his songs, showing his strengths, with what he lacks almost forgotten. Next stop, Michelle Shocked… an artist that I had previously heard a lot about, but had missed at every opportunity. Then, as the final night of Bluesfest was wrapping up, I had the fortune of witnessing a great performance from a truly talented, charismatic artist. Complying to song requests shouted from her obviously dedicated fan base, the enthusiasm of her followers was addictive. An all smiling, positive singer, songwriter, and storyteller, with a tale or two for every song. It is clear that she has seen and experienced a lot in her 20-plus years in the business, but her outlook is optimistic, her stage show energetic, and I will not let another festival featuring Michelle Shocked go by without seeing her again. I may even attempt to delve into her extensive, almost 15 album strong back catalogue! Not being able to pull ourselves away from Michelle Shocked, we arrived almost one hour into the set at the Jambalaya tent for the man who has been credited with inspiring 4 decades of psychedelic, funk driven urban music world wide, George Clinton and the P-Funk Allstars! At first glance, it appeared that George Clinton had yet to grace the stage with his presence, then from right of stage, a camouflage-clad Clinton (sans rainbow hair) limped onto the stage, walking stick in hand. I had previously thought that Clinton was showing a little more than his mid-60s age when I saw him perform back in 2005, so the walking stick was no surprise. 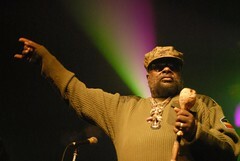 He then proceeded to discard the walking stick, and take charge of the stage, and the ten-plus strong P-Funk Allstars. This man demanded a crowd, but on this night, it seemed Bob Dylan and Grace Jones had robbed him of numbers. Six days of festival is a long time for many, and given the chance, Clinton and crew would party into the wee hours of the morning, but the vibe was just aching for more. Perhaps I was hoping a little too much for a 70s funk revival, with few remaining members still touring with Clinton. Maybe it was the lack of keyboardist Bernie Worrell on this tour? Or maybe a large chunk of funk was lost with the sad recent death of original P-Funk member Gary ‘Diaperman’ Shider? The band seemed young, and occasionally hesitant to meet the level of ‘freak’ and ‘funk’ that Clinton or his fans would demand. Fortunately, the mood switched as the band eventually moved into their hits One Nation Under a Groove, Give Up The Funk (Tear The Roof Off The Sucker), Flash Light, Maggot Brain, P-Funk (Wants to Get Funked Up), Atomic Dog, Up for the Down Stroke, and Aqua Boogie. A sample of a legendary band, that left a fanatical horde against the barrier as the lights went up, chanting the native call “Ain’t no party like a P-Funk party, Cause the P-Funk party don’t stop!” Sadly, for now, it has. And that was it for another Bluesfest, which overall was, by no exaggeration, the best I had experienced. With five under my belt, the question comes: How about a sixth? The dates are set: Thurs 5th – Mon 9th April, 2011. And if, like me, you’re contemplating returning to Bluesfest in 2012, now is THE time to make up your mind, with Pre-Earlybird tickets available at crazy prices. I know I want to. So should you. Seriously, I’m not kidding. The fine people at The Falls Music and Arts Festival have delighted the national this morning with a smattering of artists announced for this year’s event. Falls Festival, which is held each year over the New Year period in Lorne, Victoria and Marion Bay, Tasmania, has a reputation for bringing out some of the best artists in the world each year. And this year is looking as good as ever with folk giants Fleet Foxes included in this morning’s announcement, as well as Arctic Monkeys, Arj Barker, Easy Star All Stars, Tim Finn and The Jezabels. To say we’re excited here at Timber and Steel really doesn’t even begin to scratch the surface. The ballot for tickets to this year’s Falls Festival is already open so we suggest you sign up rather than risking missing out. This is going to be huge. If you’ve been following Justin Vernon’s (Bon Iver) recent live appearances you’ll have noticed that he is wheeling out his cover of Bonnie Raitt’s “I Can’t Make You Love Me” (With a little “Nick of Time” tagged onto the end for good measure) just as often as one of his originals. 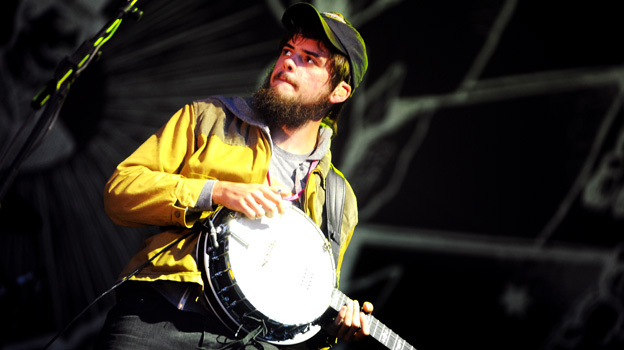 The cover actually featured as the B side to Bon Iver’s “Calgary” single and is being widely praised by the music community (as is everything Vernon touches at the moment). 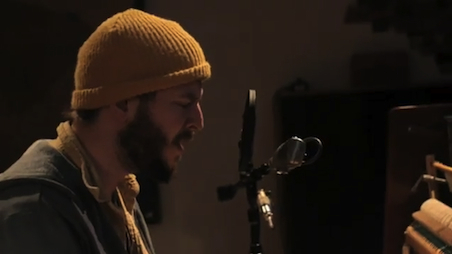 A wonderful video of Bon Iver performing “I Can’t Make You Love Me / Nick of Time” live in the studio has surfaced so we thought we’d share it with those of you who haven’t been lucky enough to hear it yet. And who knows, maybe Vernon will convert a whole lot of new fans to Bonnie Raitt – that can’t be a bad thing, right? The Bon Scotts may well be Australia’s answer to The Decemberists. Like their American counterparts, this Melbournian seven piece combine organic instrumentation, traditional influences and a rock sensibility to create wonderfully intelligent folk music. Oh, and they not an AC/DC cover band – sorry to disappoint. If you like what you hear you can actually download “Polluted Sea” from The Bon Scotts’ Soundcloud here. We reckon we’re gonna hear a lot more from these guys in the coming months. Scenes from the Suburbs, the Spike Jonze directed short film made to accompany Arcade Fire’s award winning album The Suburbs is now available to stream for free in all its glory online. Mubi.com appear to have the official embed here. Scenes from the Suburbs, which recently showed at The Sydney Film Festival, is set to appear as a DVD in a special reissue edition of The Suburbs, due for release today. If we posted every live video of every artist we love here on Timber and Steel we’d have no time or space for any of the other wonderful articles we through your way. But every now and then a video emerges that we just have to share. 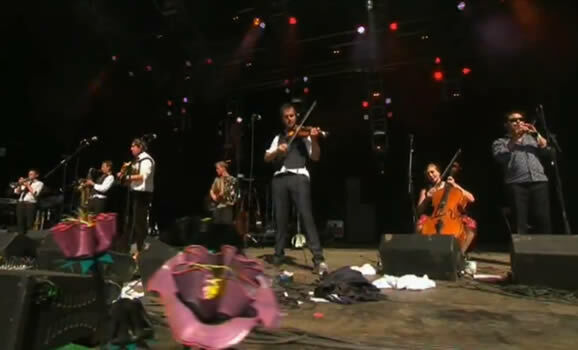 Like this one: Mumford and Sons playing “Roll Away Your Stone” live at Glastonbury last Friday, expertly shot by the good folks at the BBC. There’s a reason these guys are one of the biggest bands in the world. Sydney’s favourite subversive bluegrass trio The Lurkers have very busy boys and girls of late. Not only have they managed to pop out a brand new mini-Lurker but they’ve also recorded a new album, confirmed themselves for a bunch of shows and festivals around the country and been arrested for protesting against the coal industry. According to The Lurkers’ blog Lurkerlust, Weary Hobo (the band’s bass player), was involved in a non-violent direct action protest last year that saw him chaining himself to a coal train line, an action that subsequently had him arrested and charged (for which it seems he has since been acquitted). The whole experience spawned the wonderful new single from The Lurkers “Who’s Got a Padlock and Chain?”, the first off their forthcoming album. “Who’s Got a Padlock and Chain?” can be downloaded from The Lurkers’ Unearthed page and if you leave a review they’re even offering to send you the full album absolutely free. Sounds pretty good eh? Have a listen to “Who’s Got a Padlock and Chain?” below and then head over to Unearthed and tell the band what you think. Can’t wait for the album guys!